At American Litho Color, we use a variety of methods to produce truly stunning graphics for our clients. Whether you need something scanned using one of our drum scanners or have an image digitally proofed, we can accommodate your request and provide results that you won't find anywhere else. Get in touch with us today to request a quote for one of our printing services. For those who desire and appreciate truly fine color, there is nothing better than a drum scan. No other device is capable of digitizing an image with greater dynamic range, detail, or color reproduction. American Litho Color has two drum scanners, a L3300 and a CP-341, allowing unlimited production capacity. This large-format, overhead scanner is ideal for scanning objects that cannot wrap around a drum or for those that are too large for desktop, flatbed scanners. 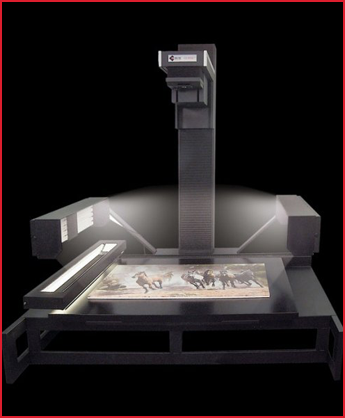 It is also perfect for scanning antique or fragile objects since nothing touches the item being scanned, which is a wonderful advantage over other large-format scanners. The color accuracy is far superior to that of desktop devices. The possible resolution far exceeds any digital camera or scan-back capture device. Plus, the resulting scan has a size/resolution ratio of 1:1, exactly the same size as the original. As with all of our imaging products, we provide not just a scan, but a color-accurate digital image with a proof. The lighting method utilized by the CRUSE scanner eliminates lens flare and light fall-off that plagues a photographic approach. Also available is a 3-D or texture mode that preserves any variation in thickness in the surface of the original, such as brushstrokes. We regularly scan items, such as paintings, drawings, maps, signs, posters, oversized photos, and even building materials, such as floor tiles and roofing. 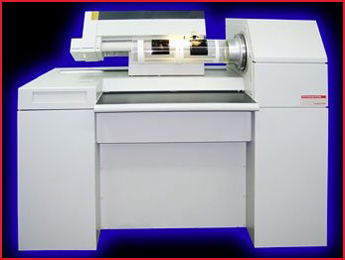 Our CRUSE scanner can scan or digitize nearly anything up to 60" x 90" x 4". Eagle Proofs are our custom solution for fast, accurate, and affordable digital proofs. We start with three HP5500 printers in 42" and 60" widths. Next, we add third-party RIPs, the latest ICC profiling devices and software. Finally, we custom profile the printer using our own custom gloss stock and match it to the SWOP Matchprint III standard, which includes SWOP color bars. The result is beautiful! The Eagle Proof is so good, it has replaced all of the more costly contract proofs. 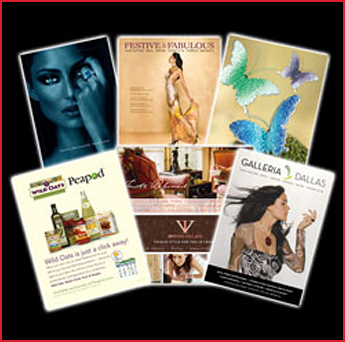 It is the ideal proof to accompany your artwork to any printer or publication. These images can be imposed as 2-up, 4-up, or 8-up and printed on a nice matte stock that can be backed up, folded, trimmed, and/or scored to make a full-color folded dummy like a blueline in "the good ol' days". When you need some products photographed for your new brochure, catalog, insert, or flyer; let us handle the job. We can shoot, and have shot, just about anything and everything. With two full studios, two of the latest Kodak digital cameras, and plenty of props and accessories, American Litho Color can give your project that extra look that extraordinary photography adds to a piece.